There are those who insist you can’t generate leads on LinkedIn and there are those who aggressively attempt to do so. Then there are those who quietly go about building their LinkedIn presence, using sound strategies, an understanding of their target subscribers – and of LinkedIn, its mission and its unique advantages. This latter type of LinkedIn user is going to be you. And here’s how to generate solid leads. It won’t be overnight: LinkedIn really is all about quality, relevant relationship building. But if you know what to look for, you’ll easily be able to jump on opportunities: For example, posting an irresistible link to a special page on your external website, if it holds the answer to a crucial question your fellow Group member is asking. That’s just one example, but it’s no secret that any success you reap on LinkedIn all starts with your Profile. If you neglect this area, you will miss valuable connections all over the place and people will not actively add you to their network. There are two types of LinkedIn Profile: Your internal Profile – the one your connections see – and your Public Profile, the one that is searchable and displayable by Google. 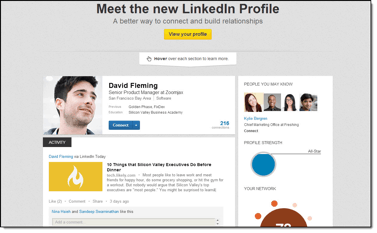 In addition, LinkedIn is heavily in the process of switching peoples’ Profiles over to a new layout. Mashable and TechCrunch have already switched over to this multi-window format, so I think we can safely assume that whether or not you find it visually confusing or pleasing, the multi-window layout is a format here to stay. Its big advantage? You can move sections around, dragging and dropping to showcase elements of your Profile you think most important to your viewer.